Copyright (c) 2015 Alan Jacobson. All Rights Reserved. Eylad Uziel walked carefully over the rough terrain of the Qumran caves. This was Bedouin territory in land governed by Jordan, but he was an Israeli—an unusual if not suicidal proposition. Then again, no one knew his true identity or nationality. Officially, he was the primary translator on the Catholic archaeological team led by Roland de Vaux, a French Dominican priest. Their sprawling, multiyear project was like no other in history: excavating the Dead Sea Scrolls. 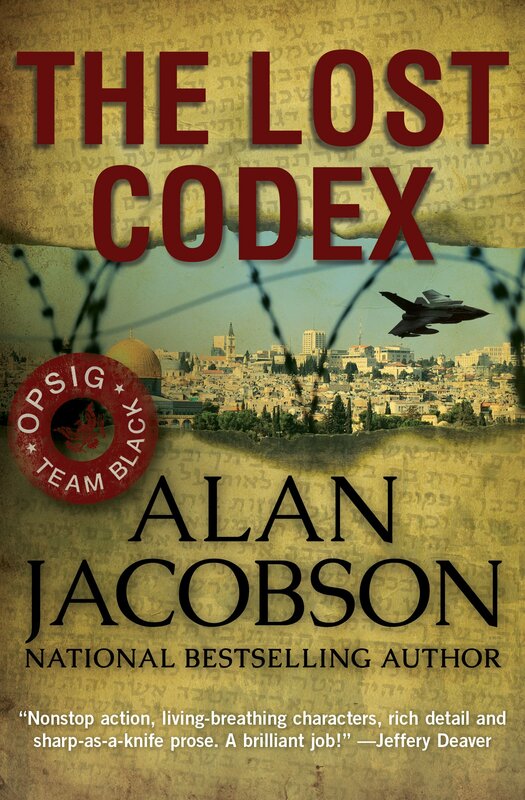 Uziel, a soldier during Israel’s war of independence and a scholar before that, had been recruited into Mossad, the fledgling security service designed to gather information regarding threats to the state. Given Israel’s location, pinned in by hostile countries determined to wipe it off the face of the earth, Mossad’s charge was a vital asset during a time of unrest. But Uziel’s assignment was extraordinary. In spring 1947 a Bedouin shepherd had stumbled onto a cave containing ancient scrolls on animal parchment that turned out to be a handwritten copy of the Old Testament, penned thousands of years ago under the threat of the advancing Romans and their conquering marauders. Uziel’s job was to blend in with the archaeologists working at the site, take stock of what was discovered, and perform a cursory accounting of its significance. Six years earlier, when the first cave had been discovered, the Bedouins who found the scrolls sold them to private antiquities dealers. Israel, like the West Bank, was still under British rule at the time and powerless to stop the plundering of what its leaders felt was its legacy: the two-thousand-year-old documents were the earliest recorded portions of the Hebrew Bible ever discovered, copied by an ancient Jewish sect whose members likely believed that they were preparing an archive to preserve their religious and cultural traditions in the event the Romans sacked Jerusalem. The scrolls belonged in a museum, not on the black market. Uziel’s scholarly work, leading digs and excavating Israel’s hidden history in stone fragments, leather parchments, long-buried buildings, coins, and religious artifacts, also entailed providing analysis to the government and its burgeoning national museum, so that the ancient Jewish civilization that populated the Judean land over the centuries could be properly recorded, studied, and brought into historical perspective. On November 29, 1947—the day of the historic United Nations vote in Queens, New York, that partitioned Palestine and led to the establishment of the state of Israel five months later—Uziel had purchased three scrolls from a Jordanian antiquities dealer. Examining the manuscripts left him thirsty to see what other parchments had been holed away in that cave—and the adjacent caves that had been excavated in the subsequent years. Not far away sat the ruins of a complex that housed the Essenes, the Jewish sect whose community members were thought to be the scrolls’ primary scribes. Despite Uziel’s efforts, and those of other Mossad and government agents, many of the ancient scrolls were still privately held—most notably, by a Palestinian family who had purchased them for a pittance from the Bedouin, who did not know the significance of what they had stumbled upon. The Vatican had stepped in and taken custody of the rest, and despite requests from numerous Catholic and Jewish scholars, kept them under lock and key, sequestered for some as yet unstated reason. Uziel made a case to the young Israeli government and national museum that they needed a set of eyes at the dig, overseeing any new discoveries. Bolstering Uziel’s argument, intelligence analysts had heard rumors that Roland de Vaux’s deputy, Alberi Michel, was a bigoted, vindictive sort who was a fascist sympathizer and displayed flashes of anti-Semitism. 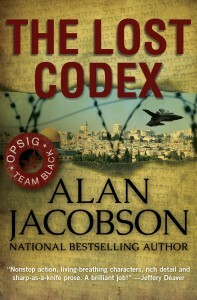 Although Mossad could not verify such allegations, Uziel’s mission was approved and conceived in a way that the Israeli government could have eyes on the ground, ensuring that whatever remained of its cultural and historical treasures were not defaced, destroyed, stolen, or sold on the black market. Uziel wore a straw hat with a wide brim and a white linen shirt, his skin brown from months in the intense sun. Standing on a precipice and looking out at the Qumran landscape, he drew a cotton rag across his brow. There was no breeze and the air was desert dry, despite the proximity of the Dead Sea, which sat off to his left, in plain view on this clear day. Directly in front of him were the undulating burnt sienna and cinnamon colored rocky outcroppings of the hills that sported small openings to the caves which had served as hiding areas for the clay jars that bore the scrolls. A loud whistle echoed across the divide a few meters away, in the vicinity of Cave 11. Uziel made his way over, navigating the rough terrain and using rope ladders stretched across the stony surfaces. Uziel quickened his pace. Finds of any magnitude were now few and far between, and witnessing the moment of its unveiling was a once-in-a-lifetime event. Uziel climbed the rope ladder, slipping twice and nearly taking a header when his toe missed the rung and instead hit a protrusion in the rock face. “What do you got?” he asked in Arabic. There were now three men in the mouth of the cave behind Uziel. He knelt beside Michel and helped him lift the clay vessel from the loosened dirt. Uziel gave him a look. Uziel laughed—-more giddy with excitement than from the comment. The two men carried the container carefully, the other workers standing aside as if in reverence of its contents. Twenty minutes later, they had the receptacle open and the scroll sitting on a work table that was shielded from the elements. They held their breath as they began to slowly unroll it. After exposing three feet, they paused and Uziel hunched over the parchment. This was why he was here: to read, and translate, the Hebrew or Aramaic. “Remarkably well preserved,” Uziel said. His eyes moved from right to left, line to line, when Michel nudged his left shoulder. Uziel soldiered on, his lips moving as he spoke the Hebrew aloud. Ten minutes later, having reached the end, he reached for the chair behind him and sat down heavily. The waitress set the glass of Board Meeting brown ale on the table in front of FBI profiler Karen Vail. Vail took a long sip and said, “Notes of dark chocolate and coffee. I’ve definitely developed a taste for this. It’s very … stimulating.” She winked at her fiancé, DEA special agent Roberto Hernandez. Two gunshots echoed off the facades of the neighboring buildings. Vail and Robby pulled their pistols in unison and ran toward the exit of the storefront bar. “That was nearby,” Vail said as she hit the glass door. So much for a romantic night out. “Anything?” Robby asked, swiveling in an arc, eyes scanning the nighttime cityscape. The vapor from their now-rapid breathing trailed off like apparitions, carried on the breeze that found its way down the collar of Vail’s sweater. She had left without pulling on her coat, and the chill made her shiver involuntarily. A shrill scream off to the right in the vicinity of 14th Street NW sent them sprinting down the block. They turned the corner—and saw a body laid out on the sidewalk, the blood pooled next to it dripping over the edge of the curb. Robby brought the phone to his ear and craned his neck to find the street signs so he could report their location. Vail hovered over the body but could not resist the urge to check the identity of the deceased. C’mon, Karen, let Metro do their jobs. This isn’t your case. This isn’t your jurisdiction. She gently patted the man’s jacket with the back of her hand, then moved on to his jeans. In his front pocket Vail felt a wallet. She forced two fingers against the denim and extracted the smooth black leather bi-fold. Her heart skipped a beat as she splayed it open and saw an FBI shield. Agent Harlon Filloon. Whoa. Was he killed because he’s a federal agent? Was he working a case? Or is it just a coincidence? “Robby.” Vail held up the credentials so he could see what she had found, then folded them and slid them into her pocket. He nodded as he finished the call and then reholstered his phone. “Something’s not right.” She rose from her crouch and glanced around, her Glock now tight in her grip, following the direction of her gaze. She moved toward the street corner a few yards away and heard feet slapping against asphalt. Fleeing suspect? Vail pressed her back against the building’s masonry wall as Robby headed toward her. He turned, their eyes met, and that’s when she saw the handgun glint in the amber glow of the streetlight. He twisted his torso and something flew from his hands as he brought up the pistol. But Vail and Robby fired first. “I think so.” He staggered toward her, slipping on shards of glass littering the asphalt. Car alarms blared as people scurried out of the nearby buildings, running this way and that, trying to escape a formless threat. As Vail made her way toward the area where the perp was standing when they shot him, she became aware of her phone ringing—-and vibrating violently in her pocket. Vail stopped and brought the handset to her face. A call from the FBI director? On a Saturday night? “Yes sir,” she said as she caught a glimpse of Robby starting to sift through the rubble. “Can you speak louder?” I just escaped being blown to bits and my hearing’s a bit muffled. Then she remembered the ShotSpotter system installed around the district: hundreds of acoustic sensors designed to capture and instantaneously pinpoint certain sound frequencies, in particular those of gunfire. “Of course.” Who am I kidding? Hopefully the director. “Who was that?” Robby asked as Vail shoved the phone back in her pocket. “Fine.” Robby backed away, then slowly disappeared into the mass of people staring at the destruction—but keeping their distance, afraid to approach. Vail did not like being rude to Robby, but what else could she do? When the boss of all your bosses ordered you to do something, you did it, right? Actually, I’d better not answer that. The cop clicked on his tactical flashlight and pointed it at her face. The officer seemed to think that was a good idea because he pulled his radio and began speaking into it—hopefully conveying what she had said and not requesting reinforcements for dealing with a deranged redhead with stolen FBI creds standing in the middle of a potential crime scene. While the cop jabbered into his two-way, a couple of large black unmarked cabover vans pulled up, two or three dozen personnel hopping out the back doors dressed in dark tactical coveralls with white luminescent block letters spelling POLICE. “You Vail?” a man with a square jaw asked as he approached. He seemed satisfied with that response because he turned and headed toward the knot of similarly attired officers who were moving gawkers away from the scene. She dashed off a quick thanks as a red Corvette pulled up. She knew that car, which now bore a personalized plate: BLACK 1. The vehicle came to an abrupt stop and Hector DeSantos got out of the driver’s seat, dressed in a leather jacket and wearing small metal rimmed glasses. Vail gave him a dubious look. But before she could reply, a DC Fire Chief vehicle—and two engine companies—arrived, their diesel engines and airbrakes making it difficult to speak at normal volume. They watched as three members of the tactical team approached the commander. A healthy helping of testosterone flew in both directions, Vail catching snippets of the argument. Finally the chief backed away, promising to escalate the matter to higher ranks—after playing his trump card that they were endangering lives by not permitting his men to check gas mains and other flammable infrastructure. As the commander turned to make his case to his superiors over the radio, a Ford Explorer pulled in behind DeSantos’s Corvette. Supervisory Special Agent Aaron Uziel, head of the FBI’s Joint Terrorism Task Force for the Washington Metro field office, got out and headed toward them. “Let’s start with the fact that Hector’s here.” She looked at DeSantos, her head tilted ever so slightly, inviting him to jump in. “And he doesn’t get involved in a case unless it’s a sensitive matter,” Uzi said, glancing at the damaged storefronts and streetscape. “How about we go get some answers.” DeSantos handed booties to Vail and Uzi, then led them down the street and into the epicenter of the blast. Some of the men Vail saw arrive in the black trucks were poring over the wreckage, taking photos and measurements along the periphery and working their way closer to the body. Or what was left of it, which wasn’t much. “A forensic crew,” DeSantos said. Doesn’t look like any forensic crew I’ve ever seen. “That’s why you’re here, Boychick,” DeSantos said, using his nickname for Uzi—-Yiddish for buddy. “Now you know how I feel,” she said. Vail knew OPSIG stood for Operations Support Intelligence Group—DeSantos’s unofficial employer—a black ops unit housed in the basement of the Pentagon that carried out covert, deniable missions around the world. Two bright xenon headlights illuminated them, throwing their shadows across the buildings behind them. “I think you’re about to get some answers,” DeSantos said. The armored black Chevrolet Suburban SUV stopped alongside them and out stepped Douglas Knox, accompanied by two members of the director’s protection detail. “Status?” Knox said, looking at Vail. They followed the man into the nearest residential apartment building, where the destruction was more pronounced. The odor of cordite was thick and the air was smoky. Using a tactical flashlight, he led them down into a basement room that was stocked with bomb-making materials—and vests in various stages of construction. Vail felt her stomach tighten. This was not just bad news. It was horrible news of the worst kind. Planes hitting skyscrapers resulting in mass murder was traumatic enough. But conventional suicide bombings in a major US city was a whole other kind of terror—one affecting tens of millions of people all day, every day, until the bomber or bombers were caught. The majority of the country’s population would be living on edge, waiting for the next explosion to rip through their restaurant, park, or playground. “Why wasn’t I told?” Uzi asked. Vail thought that was a very good question, but was surprised to see Uzi challenge the director so brazenly, particularly in front of others. “Exactly. And he’s failed us multiple times in the past. We only took it seriously because of the implications. The Agency has been unable to verify the intel with even one other source. We intercepted no communication suggesting such an attack was even being planned. Until half an hour ago. My next call was going to be to ASAC Shepard,” Knox said, referring to the assistant special agent in charge of the FBI task force, Marshall Shepard. Uzi’s boss. Vail and Uzi exchanged a look—which she was unable to interpret. Knox began pacing, the fingers of his right hand massaging his scalp. “Was Filloon on duty?” Uzi asked. Sounds to me like our FBI director is a control freak. Still, he does have a point. His reasoning is flawed for other reasons, but I’m not the one calling the shots. Vail understood he was alluding to his time in Israel dealing with the Palestinian intifadas, where suicide attacks in Israeli towns killed scores of civilians in cafés, on school buses, in discos, at wedding ceremonies. A phone started ringing. Uzi and DeSantos glanced at each other, then began searching the room. “Let me see.” Uzi took it, looked at Knox, and then reached over to a machine mounted on the table. He examined its steel casing, found a switch—and turned it on. It emitted a low groan and then he answered the call in the bomber’s native tongue. He kept his responses short, with a hint of anger and urgency—as best as Vail could tell from his demeanor and tone. She figured the noise from the machine gave him some cover for his voice not matching that of the dead man. Seconds later, he hung up and pocketed the phone. “What was that about?” Vail asked. “Who was it?” DeSantos asked. “How do you know it’s not a trap?” Knox asked. “You coming?” Uzi asked Vail as they headed back out to the street. One of the black cabover trucks pulled up to the curb down the block.